Mike Moore | The Journal Gazette Several dignitaries including Mayor Tom Henry and city commissioner Therese Brown break ground on the new Byron Wellness Community during a ceremony at the corner of Lake Avenue and Beacon Street on Wednesday. 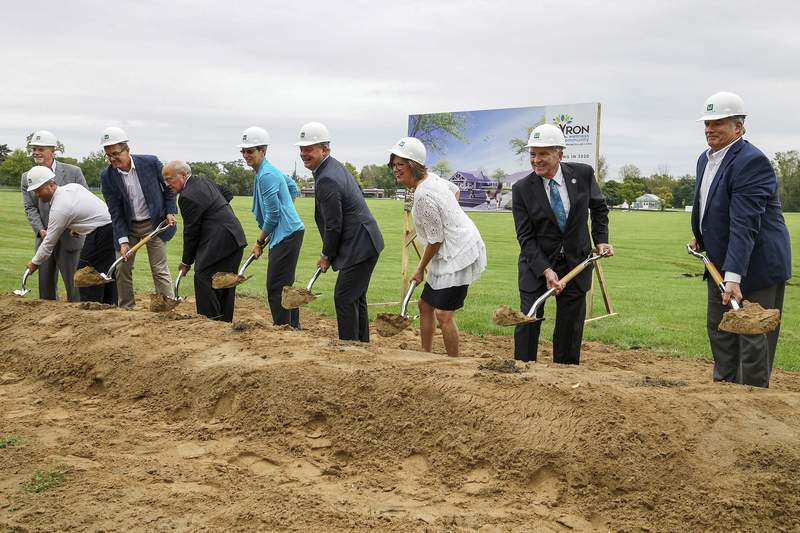 Those attending Wednesday's groundbreaking of Byron Health Center's new facility at Lake Avenue and Beacon Street didn't shout “Move That Bulldozer!” – but they could have. Deb Lambert, president and chief executive officer of Byron Health Center, capped off the typical dirt-shoveling ceremony by getting inside a yellow-and-black bulldozer and moving it – and some previously loosened turf – about six feet. The action was mostly symbolic. But it underscored the 165 years of an institution that has evolved. Now, Byron officials describe it as a facility that provides long-term care for those who need specialty skilled nursing. And, at its new address, Byron Health Center is going forward as a place where some residents can live semi-independently in five mini neighborhoods, Lambert said. “We didn't want to build another nursing home,” Lambert said. The design comes from a European model of care, she said. The $38 million investment, which will have 120 long-term skilled nursing beds and 50 assisted-living apartments, includes about $12 million in New Market tax credits facilitated by city officials. The facility will be built by Weigand Construction of Fort Wayne. Driving a bulldozer for the first time “was scary,” Lambert admitted. But it turned out easier than she thought. “You just push down and push forward, and it goes,” she said after jumping off the vehicle.